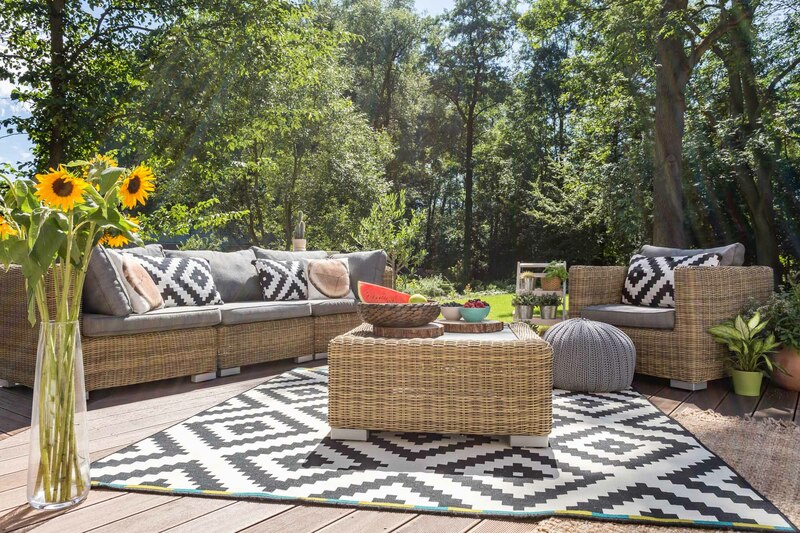 Live your best life and have all of your guests raving over the functionality and beautiful design of your outdoor space when you check out this list of the best outdoor rugs! People view having a happy home as a critical component in living the American dream. If you want to live your best life and achieve that American dream, then it’s important that your decorations are on point. Give your outdoor area that final touch that it’s been missing – an outdoor rug to tie everything together. Here’s how to make sure you’ve got one of the best outdoor rugs around. Can it Weather the Weather? There are many simple improvements that you can make to your home to up the happiness level. But there might not be anything as simple, effective, and quick as finding the best outdoor rug to spruce up your outdoor living area. Assess the area you have to work with – your outdoor space is just as important as indoor. If it’s a small space, then a small rectangular mat can do the trick. You can add to the texture and depth of the area with a more surprising shape – a circular rug is more unconventional, but always adds a beautiful touch to the area and softens up the rest of sharper angles. An oversized rug can drastically change the look of any area – throw down a huge rug outside and give your outdoor space one of the best outdoor rugs you can ask for. A big rug helps cozy up to the area and make it feel like your home outside of a home. The area where you live is going to determine what type of material you get for your mat. If you live in a relatively temperate climate, you can essentially choose whichever material you like, such as cotton or wool. However, if you live in an environment with more aggressive weather, you might want to lean more toward rugged materials such as natural fibers, synthetics, or a Waterhog mat, a water-resistant outdoor rug. These are some of the best outdoor rugs for rain. Choosing which pop of color to add to your area can be simple if you have the right tools. To get the best idea on what colors would look best together, there are tools like Adobe Color CC. You can see which colors are complementary to the scheme your outdoor area already has, or which work in a monochromatic sense. You can also stay up to date on your color psychology and see what kind of vibe you’re trying to evoke from the rug that you choose. Study up, and use color to make people feel a certain way when they step into your outdoor space. If you need a place to find all the best commercial outdoor floor mats available in every color, you’ll want to read more about it. Eagle Mat has a comprehensive list of outdoor rug types and where to buy them. It’s time to stop reading about it and get that outdoor living space looking like you’ve always wanted it to. Hop online and get the best outdoor rugs for your area, now that you’ve narrowed it down and know exactly what you’re looking for.